Jill Stein speaking at the Kate Buchanan Room at Humboldt State University on March 8 at 6 p.m.
Jill Stein stepped on stage as a welcoming crowd of more than 300 community members clapped and cheered. She raised a peace sign in the air, which brought people in the Humboldt State University lecture hall to their feet. 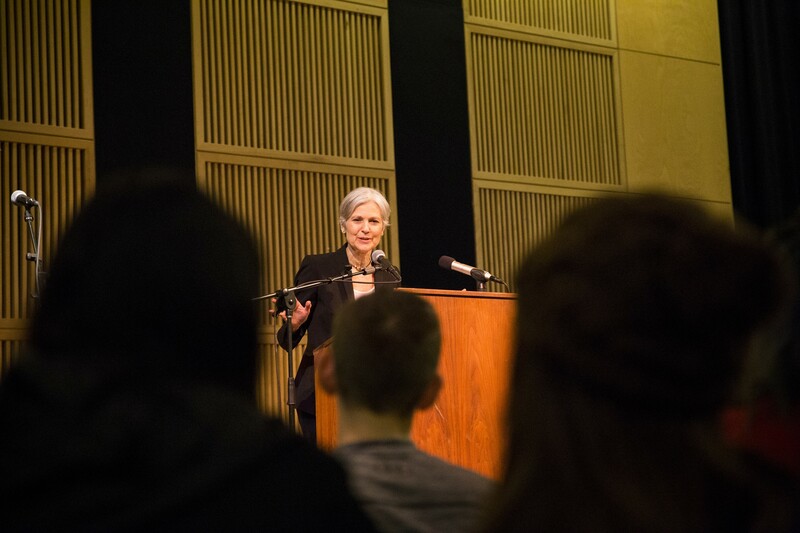 Stein, the Green Party presidential nominee, came to campus to discuss a wide array of political topics yesterday. Although subjects ranged from vaccinations to Russian agents, there seemed to be a few general themes throughout the night. Indigenous rights and solidarity, environmental activism, political establishment and the future of the American people were recurring themes that dominated questions and discussion more than over three hours. The discussion was followed with questions and praise from community members and students. Just before Stein came on stage, she was introduced and welcomed by a handful of students and community members. Nicola Walters said she was honored to have put her body on the line at Standing Rock and Stein won her vote by doing the same. “I was honored to stand alongside Indigenous elders, Veterans for Peace, activists from the American Indian movement and water protectors from across the country for something that was bigger than myself,” Walters said. Walters is a student in the middle of her thesis in Southern Humboldt focusing on environment and communities. She said the only reason she picked up a ballot this year was to vote on local races and measures, but she ended up filling the bubble for the Green Party as a vote for the environment. Another community member welcomed Stein by playing a song she wrote and composed titled, “Water is Life,” which was inspired by Standing Rock before the election. Sarah Torres, one of the people who introduced Stein, began by saying she wanted to acknowledge that everyone present for the event was on Wiyot land. “You took my land from so long ago,” she sang to the slow acoustic sound of her guitar. According to the Humboldt County Election's Office, Stein received a little more than 3,000 votes in the county, which saw a 73 percent voter turnout. In comparison, Hillary Clinton took more than 33,000 votes in Humboldt and Donald Trump took about 18,300, while Gary Johnson finished with with about 1,200 local votes. But nationally, Stein has been criticized for siphoning votes away from Clinton in what proved to be crucial battle ground states, like Pennsylvania and Wisconsin, where she received more than 1 percent of the vote, according to CNN. 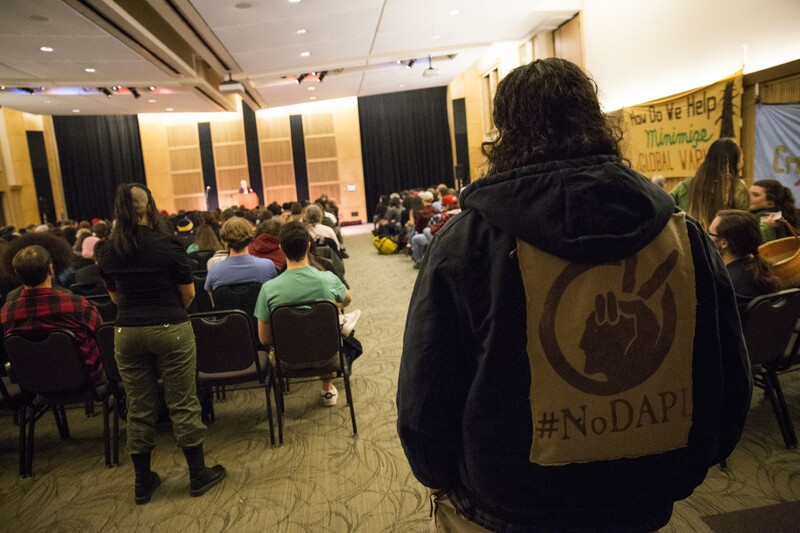 Erik Rydberg wearing a jacket that reads "#NoDAPL" at the Jill Stein discussion held at Humboldt State University on March 8. A long line of people lined up to ask questions of Stein during the event and when time started to run short, organizers instituted two lightning rounds were people got only a minute to ask Stein whatever was on their minds. Questions ranged from her view on vaccinations, indigenous rights and our present political climate took up the last hour and a half. Responding to a handful of community members, Stein said she was never anti-vaccination, though she said she questioned big pharmacy companies and their research on vaccinations. 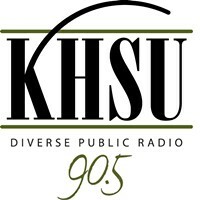 In a little more than three and a half hours, Stein and the gathering discussed topics that ranged all over the political spectrum. She spoke of climate change, the democratic party, Bernie Sanders supporters, DAPL and urged the younger generations to get involved. 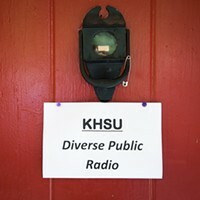 The event was organized by Climate Crisis and HSU's Green club. 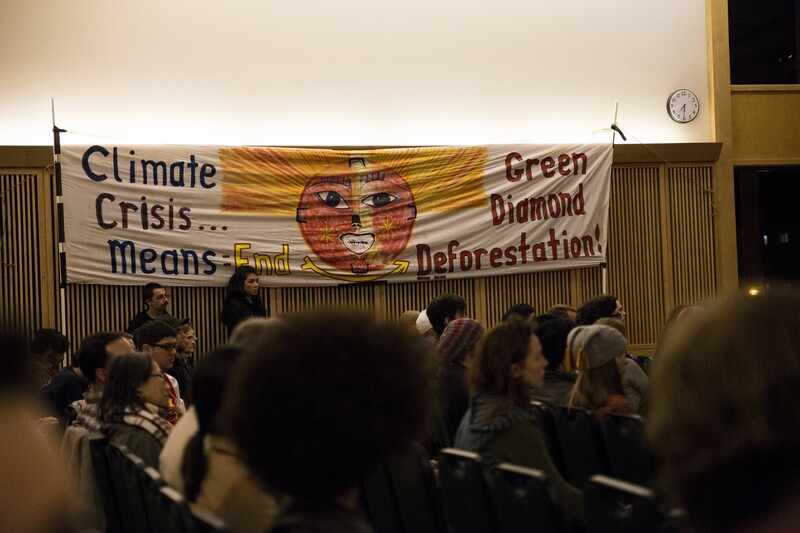 Banners were displayed inside the KBR while Jill Stein discussed politics on March 8.